In my quest for a stash of teen cards - I grabbed Grunge rock in hopes that since these kids are addicted to music in their ears - this would be a winner! I haven't spent much time with it - but I do like it! I really like the design on the guitar! ﻿I incorporated the Stampotique Designers Challenge of SDC28: Newsprint/Old Book Pages, mainly because Kim Howard forced me convinced me to try it. I paired it with the colors of the Colour Q. I was going to use flowers for this color challenge, but I am glad I used it with the Grunge Rock set instead! I like it too, Chera. Fabulous creation! 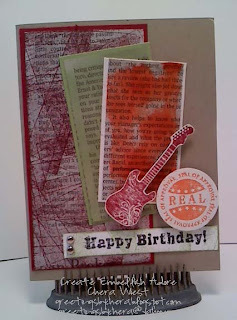 Thanks for joining us at Stampotique Designer's Challenge # 28. Wonderful card. Love how you combined the different elements and colors. Thanks for joining the Stampotique designer's challenge! Hi Chera love your card. It rocks! Thanks for joining us at Stampotique Designer's Challenge. Fab card-I've just bought a guitar stamp like that! he he, forced you eh? Great job, love the grunge rock! Thanks for joining us at Stampotique Designer's Challenge. awsome guitar ! Thanks for joining us at Stampotique Designer's Challenge. Cool card, Chera! Thanks for joining us at the ColourQ this week. Perfect teen card--I love it! Thanks for playing with the CQC this week! LOL, so glad Kim convinced you to try it - it turned out beautifully! Thank you for joining the fun in this SDC! I'm glad you did as Kim told you, this is a fab and funky card. Thanks for joining us at Stampotique. Kim is right to have eehmm convinced you, gorgeous card! Thank you for joining us at Stampotique!